arPath MMA VI is set for 8pm on Friday, June 22 at the new Squiala Community Hall, at 45005 Squiala Road (off of Ashwell Road) in Chilliwack, BC. It’s only been a month since the last event, but the fighters and the fans are already anticipating another exciting evening of live entertainment that you cannot find anywhere else in Chilliwack. Tickets are $35 and $75 each – available at Revolution Martial Arts at 8030 Enterprise Drive, off of Yale Road West, or, at Fuel Clothing at the Chilliwack Mall, or, online at www.warpathmma.com. 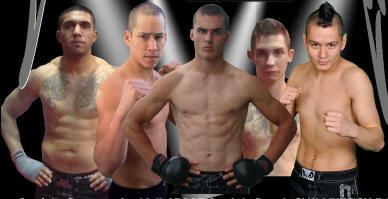 Revolution Fight Team Brandon Wolkosky, Griffin Steele, Bryce Kilpatrick and Ed Canuel, are matched up against other MMA gyms in the province, including Mamba MMA from Abbotsford B.C., Suitela MMA in Surrey B.C., Mata Leao from Kamloops, B.C., CV Boxing from Comox Valley B.C., and Wolf`s Den from North Vancouver, B.C. Local fighters train under Revolution Martial Arts coaches, including Harley Chappell, Brazilian Jiu Jitsu coach, Darwin Douglas, Muay Thai Kickboxing coach, Sean O’Halloran, MMA coach, Americo Pena, Wrestling coach, and, Mike Dowsett, Boxing coach. The support for WarPath MMA VI continues to grow. 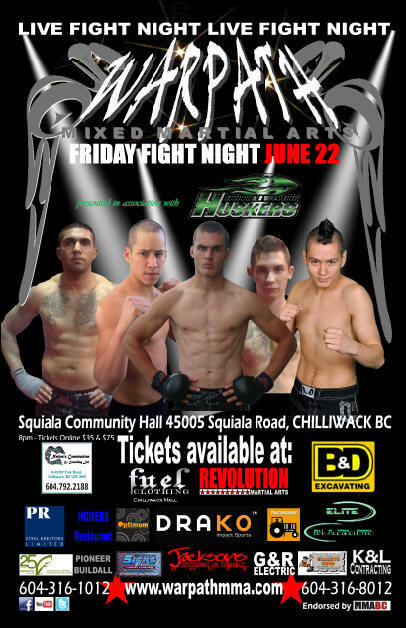 Chilliwack Huskers, is excited to support their second MMA event, Homers Restaurant is on board for their first MMA event, and, our other dedicated MMA sponsor are Tractor Grease Productions, PR Steel, Nations Construction and Consultation, B&D Excavating, Elite Nutrition, Jackson’s Steak and Grill House, G&R Electric, K&L Contracting, Drako Fight Gear, Optimum Sports and Performance, Devison Printers, Swinstones Granite Shop, and, Pioneer Build all.